Most folks whiz through Mills River with hardly a glance about. There are two traffic lights on the main thoroughfare, and as of publication, neither intersection alludes to the presence of WNC’s largest brewery, which opens to the public August 3 with the last leg of the Beer Camp Across America festival, offering a tasting of suds made in collaboration with other noted craft breweries. Sierra Nevada is, in fact, one of the largest producers of beer in the country (No. 7). With its main headquarters operating since 1979 in Chico, California, the WNC location is its first expansion. The 190-acre campus will offer an array of features, some which have nothing to do with beer. Bill Manley, beer ambassador for Sierra Nevada, says the facility sets a new standard. “There hasn’t been another brewery like it ever built,” he says. “We’ve got a lot of plans.” In addition to producing beer, the East Coast operation will offer a restaurant, indoor and outdoor music venues, hiking and biking trails, river access, ornamental and edible gardens, plus energy production from 2,200 photovoltaic cells and two beer by-product powered turbines. The brewery experience that’s slated to begin in August focuses on tours, the tasting room, and the gift shop. Before the end of the year, the restaurant is expected to open, with a menu of local, seasonal fare. That timeline leaves the music venues and trails for development in 2015. This might sound like a lot for one space, but the brewery has room to spare. It occupies just 30 acres—or about 15 percent—of its property. “We’ve got an awful lot of wild land around there, so we’re pretty happy about that,” Manley says. But what about the beer? Well, actually, it’s already shipping out from Mills River. So that bottle of pale ale you pick up in the grocery store might be locally made. 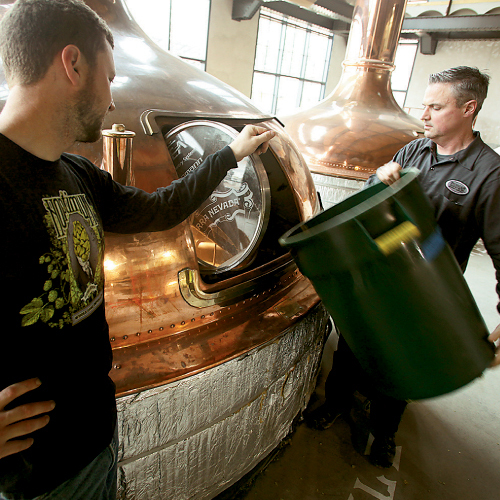 Sierra Nevada started brewing in February, and plans to produce 350,000 barrels—or about 10.8 million gallons—each year. While Sierra Nevada is a big corporation with international distribution, WNC is sure to become closely linked to the brand. Already, the bottles list Mills River and Chico as points of origin, and the WNC facility is poised to take over production of the brewer’s Kellerweis, a Bavarian-style wheat ale. While the brewery is spreading the word about WNC worldwide, it’s also developing a special relationship with the region (and that means special beer). “We will make some beers that are just for the market here in WNC,” Manley promises, although further details are still a secret. Clearly, there’s much to look forward to.